Vancouver’s Cloudscape Comics Society debuts a treasury of tales inspired by the briny deep in its latest top-notch showcase of local talent. Waterlogged overflows with accomplished graphic storytelling from across the comics spectrum and at 200+ pages, is a massively fun read! 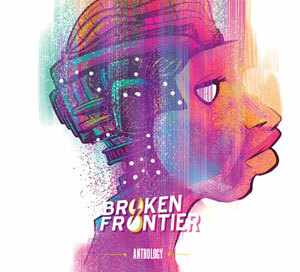 The art of the anthology is a fickle beast to master. The good folks at Vancouver’s Cloudscape Comics Society have something to proud of when considering this fact. They’ve been at the anthology game for quite some time now and have just released their seventh book, Waterlogged: Tales from the Seventh Sea. Guided by the watchful eye of editor-in-chief Jeffery Ellis, Waterlogged is a collection of short stories featuring the cream of the Vancouver comics crop, that explores the timeless, undeniable lure of the sea in all of its myriad permutations. From the straightforward pirate adventure to comedic, cartoonish interludes to the intensely introspective, Waterlogged spans all genres with crafty skill and obvious passion. More than a simple showcase for local comics talent, Waterlogged is a seriously high quality publication despite its grass roots. The artists, writers, and editors of the CCS know what they’re about. Weighing in at over 200 pages, there’s a little something for everybody concealed within Waterlogged’s pages. Consistency is ever-important in the anthology game and herein lies the strength of CCS’s collection. Every story contained within its covers achieves a level of graphic storytelling that is off the charts. Many of the tales eschew dialogue altogether, relying on the artist (if he/she is a separate person) to tell the story purely through the visuals. It’s a terrific feat to pull off in a medium that prides itself on its ability to marry words and pictures fluidly and a testament to the creators involved that these silent shorts are some of the strongest entries in the collection. As with every anthology, there are those tales that resonate a smidgeon more than others. Some of the stories that stood out for me due to their craft and originality are “Grandpa” by Bevan Thomas and Reetta Linjama, an intimate examination of loss viewed through the lens of Tennyson’s nautical-themed “Crossing the Bar”; the epic, impressionistic illustrated poem “Rhyme”, by Shannon Campbell and Sam and Fuzzy’s Sam Logan; and “Deep Rule” by Cameron Morris and Bongo Comics Eisner-winning penciler Nina Matsumoto, in which a shunned salt bride lays plans for her royal inheritance. Appended with a wonderful rogue’s gallery of fictional pirates and sea-scoundrels and wrapped in an absolutely gorgeous cover by Laura Bifano, Waterlogged is an exquisitely produced book showcasing its contributors’ immense talents not merely via their inclusion within its pages but by its dedication to high quality publishing.